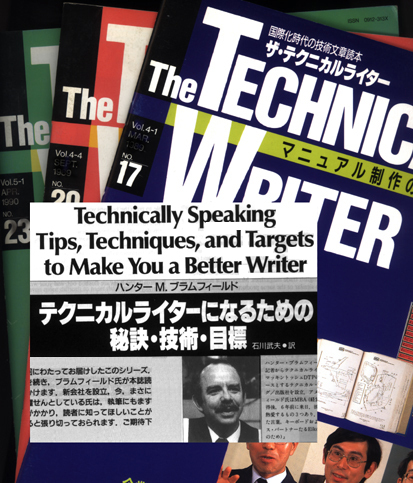 Over a four-year period, The Technical Writer magazine commissioned me to write on subjects of interest to Japanese and English technical writers. The magazine, published every two months, was published in Tokyo during the 1990s in an effort to boost the quality of technical and corporate documents produced in Japan. On the order of 18 such articles appeared in English and were accompanied by a full Japanese translation. Here are some of my favorites, which seem no less valid today. Please check back for more articles to be added later. Scratch a technical writer and beneath the surface you'll discover a master organizer. Correction ... scratch a professional technical writer and you'll discover, if not a master organizer, at least someone who observes some standard organizational practices to help make the work go more smoothly and finish on time. Fortunately, these practices come from guidelines and writing techniques all of us can adopt without too much difficulty: Mainly they are just good common sense. In this issue of The Technical Writer, Mr. Brumfield discusses how technical writers and their managers can put these common-sense practices to good use. Can a technical document actually be offensive? Yes, it can  if poorly chosen words, examples, and illustrations demean or neglect women and minorities, who make up a growing percentage of the buyers and users of high-tech products. Especially documents headed for the U.S. and points west should be carefully scrutinized for signs - some of them not so obvious  of sexual and racial stereotyping. In this article, Mr. Brumfield discusses how you can keep the "red flag" words and illustrations out of your own writing, and at the same time weed out biases that may be completely unintentional, yet still have harmful psychological and social effects. Caught up in the rush of the work and the complexity of a manual, it is easy to forget where you are sometimes in the big scheme of things. In this issue of The Technical Writer, Mr. Brumfield looks at the writer not as a person laboring alone, but as an important part of a team of documentation specialists. He also outlines an approach to meeting the increasing demands being placed on technical and corporate publishers by the rapidly changing nature of the business. Do your eyes glaze over at the thought of having to construct an index for that three-inch-thick manual you just finished? Remember that first time you were given an important proofreading assignment? Or perhaps you're destined, by choice or chance, to eventually find this a regular part of your job. In this article, the author looks through the eyes of Mr. Ando, a young proofreader who has been doing a lot of learning lately from a stern but understanding boss.